sorachi ace | tap this! It’s almost turkey time in America and for each of us that may mean something different. Maybe you are traveling across the state or across the country to spend the holiday with family and friends. Maybe you actually prefer to go out to eat on Thanksgiving because the idea of cooking or spending the day with your family is frightening. Or maybe you are the one hosting the Thanksgiving feast this year. Anyone cooking for Thanksgiving, whether it be for a few friends or your entire family (second cousins included), knows they need to do a lot of planning and preparation for their meal ahead of time. This year, how about introducing some great craft beer to your table to pair with your home-cooked meal? If you are a new home-brewer, maybe this is the time to introduce your family and friends to your hobby—Try pairing your homebrew with different dishes at the table and see what works best. If you don’t homebrew, or don’t think that experimental ale you made last summer would go too great with your mother’s famous stuffing, there are plenty of American craft beers that would be welcome guests at your dinner table. Let’s start with the meal’s centerpiece: The Turkey. According to Garret Oliver, one of the most well-respected brewmasters (from Brooklyn Brewery) and an expert on pairing beer with food, turkey and a nice Biere de Garde (a French Farmhouse ale) are a match made in Thanksgiving heaven. Since Biere de Gardes are not exactly commonplace and may be difficult to find locally, a Belgian-style Saison also makes a lovely pairing with the bird. The differences between the two styles are subtle: a biere de garde tends to be maltier and hence sweeter while most saisons are lighter and crisper with nice spice notes and a floral aroma. While both are usually spring/summer seasonals for a lot of breweries, both go great with turkey, no matter how you are preparing it. When I think of American-brewed, Belgian-style ales I automatically think of Brewery Ommegang. Any of their complex beers pair so wonderfully with food! Plus, their brews are easy to find in the NYC area. I would suggest their Hennepin, a farmhouse saison, whose peppery, fruity notes would go great with the bird. Ommegang’s Hennepin is certainly a benchmark version of this style that you should not have any difficulty finding in the city. Another beer within the same “farmhouse” family is Brooklyn’s Sorachi Ace. The buttery flavors and lemony aromas imparted by the Japanese-bred Sorachi hop in this singularly-hopped saison would go great with your turkey dinner. But for a more versatile and catch-all beer that goes great with more than just turkey, Ommegang’s Abbey Ale would pair well with almost everything else at your dinner table this Thanksgiving. The Belgian-style dubbel is so complex tasting (plums, cherries, toffee, figs) that it begs to be paired with a rich, hearty meal no matter what cuisine you’ll be serving on Thursday. Try to find a wine as flavorful or dynamic as this beer—your friends and family will certainly be impressed with its versatility! You may even convince your wine-loving aunts and uncles that beer too, goes great (or even better) with food. Now on to the sides. Mashed potatoes? How about a brown ale or a porter. There are several local examples to choose from including Sixpoint’s Brownstone (although I’d pour it into a nice glass and avoid the odd stares you may get from your family when drinking beer from a can) or Brooklyn Brown Ale? While these two Brooklyn-based breweries both offer fine brown ales that pair wonderfully with hearty fare like mashed potatoes, gravy and stuffing, Smuttynose’s Old Brown Dog Ale or their Robust Porter are also great choices. There are many more great examples out there so pick your favorite but think hearty, dark, and malty beers for your heavier Thanksgiving fare. Although you may be a fan of hoppier American beer styles like West Coast IPAs (you and your brother love to compare notes on the latest and greatest plate-wreckers), these will not pair as well with your Thanksgiving dinner. Unless, of course, you are implementing some major spices or going a non-traditional route with your cuisine. But if you plan on sticking with the standards this season, I wouldn’t suggest pouring Imperial IPAs at your dinner table. Save those beer styles for another occasion. Last but not least, there’s dessert. At this point in your meal, you are most likely beyond stuffed but if you’re like me, there’s always room for that last course! And it just happens to be MY favorite part of the meal as I enjoy doing the baking and of course, the eating. Pecan, Pumpkin or even sweet potato pies go great with a spiced ale or any kind of flavorful stout. Brooklyn’s Black Chocolate Stout is an obvious choice, but I’m thinking that western New York’s Southern Tier has some great beers that would impress your guests. If many of Ommegang’s delcious Belgian-style beers pair well with your dinner, then I would say that any of Southern Tier’s “Blackwater” beers would go just as lovely with dessert. Their Choklat, Jah-va, Mokah, and Crème Brulee Stouts practically beg to be drunk with sweet treats. There’s also the fall seasonal favorite, the pumpkin ale, and you know your cousin loves her spiced beers. Southern Tier’s Pumking is a favorite of many of my family and friends, and if you can manage to find one this week (or you’ve been hoarding some all season), Thanksgiving would be a lovely time to share it. What will YOU be drinking this Thanksgiving? Looking for something to spice up your weekend? Go to the Staten Island Yankee Craft Beer fest! Not in NYC? Why not host your own tasting party? I’m sure you’ve been to a beer-tasting event, whether held at your local beer shop or bar or at a beer festival, where hundreds of different beers are at your fingertips, and you most likely don’t have the time (or physical endurance) to taste them all. But what about hosting your own? Maybe you’ve acquired unique bottles on your summer travels and haven’t had the opportunity to try them. Or you pick up a rare bottle one day because you are feeling adventurous and are “saving it for a special occasion” (like my bottle of ‘Hops N’ Roses’ from Captain Lawrence that I haven’t gotten around to opening yet). Trying new beers is always exciting, especially for us beer geeks, but sharing them with other craft beer connoisseurs is even better. Recently we were invited to our friends’ apartments to put a dent in their pretty impressive beer selection. 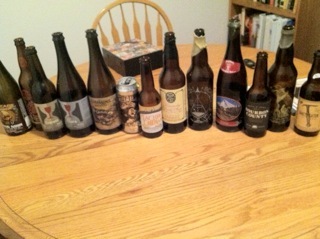 What was even better: Many of these beers (or rather, most) aren’t even available for purchase in the NYC area. So how do find a community of fellow craft beer lovers to share your beer with? If you’re as lucky as me, then all your friends have good taste (in beer at least) and it’s not hard, but joining a local craft beer appreciation society (like my local Richmond County Beer Club) or joining your local craft beer bar’s beer club is a good start. 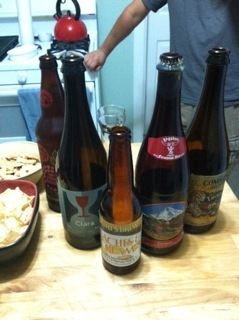 Also, in past years, I’ve turned birthday parties into beer tastings. Put some records on (yes I have a vinyl player) and put some snacks out—along with a bunch of your favorite brews. Give your guests a glass and taste away. Sure beats pizza, soda and cake (ok, well don’t skip the cake if it’s a birthday party). And cheese pairs beautifully with beers—pick up some stilton and some brie from a local dairy and you’ve got yourself a party. Crusty bread and crackers are necessary too. Use some of your beer to whip up some beer cheese or mustard and serve with pretzels. At this recent tasting I was lucky enough to sample Kentucky Dark Star, an Imperial, bourbon-barrel aged oatmeal stout from Fremont Brewing Co. in Seattle (where my friends hail from). It was an impressive bourbon barrel aged beer, creamy and oaky, with hints of vanilla, chocolate balancing with a roasted bitterness. We compared this to an Imperial Schwarzbier also aged in bourbon barrels, from restaurant/brewery Flossmoor station outside of Chicago. The nice thing about hosting your own tasting party as you can try any beer you want at any time, but to really enjoy all flavors you’re experiencing, it’s good to start with lighter styles (we started with some sours) and move from there. Save the palate-wrecking IPAs for last. Or maybe you just want to stick with one style: Everyone seems to be really into sours these days but perhaps have not tasted a lot or even found one they like. Have everyone bring one or two examples of their favorite sour beer and drink away. You can make your upcoming Halloween party a pumpkin beer party. Have your guests bring their favorite pumpkin beer (you could even include some ciders in here since its cider season and drinking it is more fun than bobbing for apples). Offer some sweet treats and pair them with your pumpkin beers—even better than trick-or-treating. Hosting (or attending) a beer tasting party can make your usual weekend plans a little more exciting. Watching the alumni football game with the guys this weekend? Bring a six-pack or a growler of your current favorite session beer. Sure beats choking down “The King of Beers,” in the back of your buddy’s fridge. And if you want to get fancy, you can make your next dinner party revolve around beer and food pairings. Your guests will be impressed.